Dublin are through to the Bank of Ireland All-Ireland Football Championship quarter-finals after defeating Roscommon by 1-14 to 0-13 at Croke Park this afternoon. Jason Sherlock shone for the Dubs as his personal tally of 1-05 inspired his team to victory in an entertaining encounter at headquarters. It was Roscommon who got straight down to business with the game's opening point from Gary Cox after just 17 seconds. And two minutes later Francie Grehan found Nigel Dineen who made time and space to put Roscommon two points up. Ger Heneghan was then pulled back by Coman Goggins when heading towards goals and he duly struck over the resulting free to see Roscommon three points to the good. Dublin got off the mark in the seventh minute when Jason Sherlock shook off his marker to blast over from close range. Then Brian Cullen ran unchallenged a good 30 yards up the centre of the field to point as Roscommon players looked on - and a minute later the teams were level when Alan Brogan pointed to cancel out all Roscommon's good early work. Cullen then added a beautiful 45 to give Dublin the edge after 13 minutes. Roscommon hadn't scored in eight minutes at this stage so Seamus O'Neill's massive equalising point will have come as a relief to the Roscommon fans. 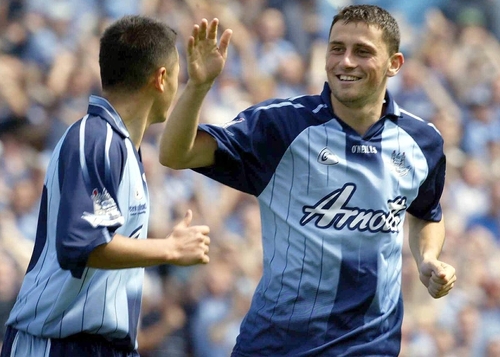 Brogan then linked well with Darren Homan, who scored from a tight angle to see Dublin ahead once more. Roscommon broke downfield again and Seamus O'Neill took up the running before letting lose a shot at goal from the edge of the square. It was at the right height for Stephen Cluxton in the Dublin goal however and he palmed away. The rebound broke to Johnathon Dunning but his return shot was also saved – this time by Paul Casey on the line. Roscommon did manage a consolation though when Stephen Lohan excellently converted a free from a very tight angle immediately after. 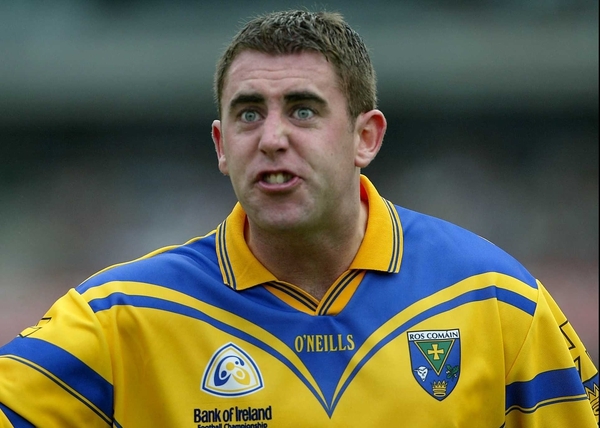 And Lohan followed that up by finishing off a delightful Roscommon move to give his team the lead once more. Ciaran Whelan struck back for the Dubs before Jason Sherlock made his mark with a coolly taken goal. A mix-up between Ray Cox and John Whyte in the Roscommon defence meant a breaking ball found Sherlock on his own with the goal beckoning. And he kept his composure to jink a lovely shot past Shane Curran. Roscommon showed their determination though with a point immediately after from Stephen Lohan. Another Heneghan free shorlty after left just the point between the two but Dublin hit back once more for Brogan to finish off a move started by Sherlock. The teams swapped another point each to see Dublin leading by 1-08 to 0-09 at the break. Dublin started the second half with the breeze on their backs and went straight downfield where Ian Robertson took a high ball to feed Ciaran Whelan who sent his shot over. Robertson assisted once again minutes later – this time he fed Brogan who pointed from close in. Dublin really had their tails up now and were beginning to win the majority of 50/50 balls so Lohan's point during this period was a tonic Roscommon really needed. But they were being made work really hard for their scores while Dublin's were coming a lot easier. That was highlighted when Sherlock sent over a huge point minutes later to maintain Dublin's four-point advantage. Heneghan then struck his first point from play after a determined run through the heart of the Dublin defence, but Sherlock once again restored the four-point margin with another lovely point from distance. Up the other end of the field Dunning's persistent running earned a free for Heneghan to convert. Dunning then made way for Frankie Dolan to the delight of the Roscommon support. Dessie Farrell's introduction a minute later for Conal Keaney brought about the same reaction from the Dublin fans – unfortunately though he left the field only five minutes later after picking up an injury to his right knee. Dolan's first contribution of note was to send a lovely ball into John Tiernan who collected well but hit his goal chance weakly wide. 13 minutes then passed with neither team scoring but Sherlock broke that dry spell with another massive point to see Dublin 1-13 to 0-12 on 63 minutes. Another strong run by Heneghan gave Tiernan another chance and he sent the ball over to leave just a goal separating the sides with four minutes to go. Roscommon began to pile bodies forward in search of the goal needed but Dublin defended well before breaking down field where Senan Connell struck the point to make the match safe and see Dublin through to the quarter-finals.